Justice for Darren Cumberbatch – Jail killer police! The woman who drove the car that Edson Da Costa was stopped in by cops shortly before his death has spoken to Socialist Worker about his treatment. Edson died in hospital last week six days after the police stopped the car in Beckton, east London, on 15 June. Jussara was among a group of protesters, including some of Edson’s cousins and friends, who gathered at Forest Gate police station in east London yesterday, Tuesday. During a 200-strong protest over the killing last Sunday, Newham borough police commander Ian Larnder told protesters he would meet them on Tuesday. 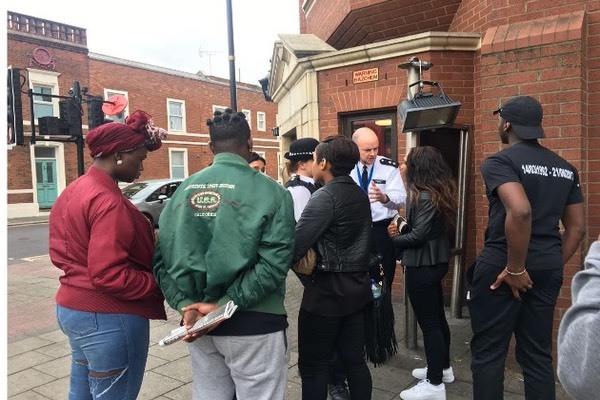 Initially cops at Forest Gate police station told protesters they had no appointment. But the determination of Edson’s relatives and friends forced them to meet with two of Edson’s cousins. They told Socialist Worker that, in the meeting, Larnder confirmed that none of the officers involved in the stop had been suspended. They said he also confirmed that police had used CS gas on Edson. Some of Edson’s friends and family visited the estate where the car stop took place to lay flowers. They described how neighbours came out to share their eyewitness accounts of the stop—and footage of the incident. Maria said, “I wish people could have gone to the hospital and seen him. The first thing you noticed was his neck. It was triple the normal size. He had to have something to hold his head straight because his neck wasn’t strong enough. The cops have tried to downplay any injuries that Edson received. Instead they have claimed that Edson died after ingesting drugs. The cops’ pet watchdog the IPCC released a new statement on the case the same day as Tuesday’s protest. It said that a pathologist had “removed a number of packages from Mr Da Costa’s throat”. But as his relatives and friends pointed out, police are trained to deal with such situations. And possession of drugs doesn’t give cops a licence to kill people. Jussara said, “When they think someone has something in their mouth, they are supposed to allow them to swallow it and bring them to the police station. Why should people suffer capital punishment just because the police say they think a crime has been committed? Edson came to Britain from Portugal in 1996 and had a young son here. He was just 25 when he died. Many of those angry over his death are familiar with the deaths or mistreatment of black men at the hands of the cops. People are determined to fight for justice and to stop the police covering up the truth about how Edson died. Jussara said campaigners want to make sure that “next time, when someone gets arrested, this isn’t going to happen again”.